Staff of A Woman’s Place (AWP), Bucks County’s only domestic violence organization received a pleasant and entirely unexpected surprise in the closing days of 2018 when local philanthropist David Rocchino placed an impromptu call to the agency. Though known for his work in supporting local college students with scholarships, Mr. Rocchino requested a meeting to learn more about the work at A Woman’s Place. Members of the foundation’s Executive and Advisory boards, including Mr. Rocchino’s wife Elisa (VP), long time business associate Elena Kriebel (treasurer), and newly-elected Pennsylvania Representative Wendi Thomas (advisor) met with AWP staff and board to consider a potential gift. On December 31st 2018,The David S. Rocchino Family Foundation made a sizeable monetary gift in honor of Philomena M. Sciarra, the chairman and founder’s mother. Philomena passed away peacefully at 94 in 2018. Philomena was a strong, independent woman who was a proponent of woman’s rights and was outspoken against domestic abuse both mental and physical. A highly educated and accomplished woman, Philomena instilled in her children and grandchildren these same principles. The sizeable gift from the foundation will be used to offer critical services for survivors of domestic abuse here in Bucks County. AWP Executive Director Tammy Oliver was particularly thrilled about the additional client services this gift will allow AWP to deliver: “As a survivor-centered organization, AWP strives to put the needs of our clients at the center of all of our thinking. This extremely generous gift from Mr. Rocchino’s foundation will allow us to offer comprehensive counseling, legal, and empowerment services to up to 100 additional clients this year,” Ms. Oliver stated. The foundation’s primary focus is granting scholarships to “gap students” at Penn State’s Schreyer Honors College – those honors students who have financial need but not enough need to qualify for full financial aid, perhaps due to a family emergency or death in the family. 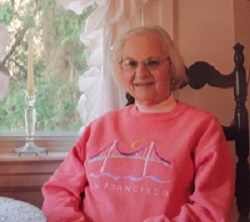 The passing of Ms. Sciarra inspired the foundation’s founder, David Rocchino to explore options for the foundation’s giving in 2018 in addition to their already sizeable scholarship funding. Over 5,000 people in Bucks County called A Woman’s Place’s 24-hour domestic violence hotline last year alone. 1 in 3 women and 1 in 4 men will experience abuse from an intimate partner. Domestic violence is a community issue and A Woman’s Place is proud to serve Bucks County with the extremely generous support of individuals and organizations like the David S. Rocchino Family Foundation. For more information on all of AWP’s services, events, and programs, visit www.awomansplace.org.